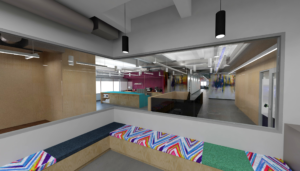 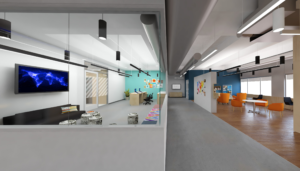 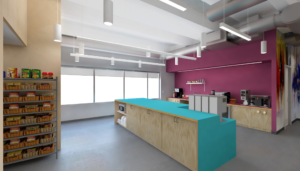 Our challenge was to redesign the interior layout of a brand new, three story, market-ready building, slated for multiple tenants into a single tenant occupancy. 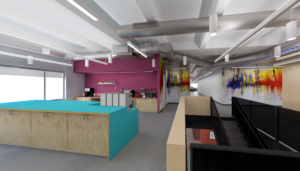 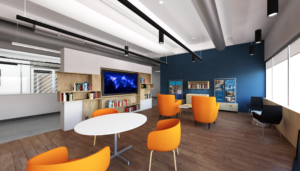 Our goal was to provide our client with an design that correctly expressed the ideas and core values of the company today, while launching them into the mature company they want to become and project. 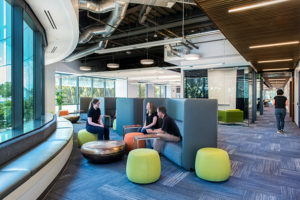 Additional challenges included on-the-fly design of the partially built out core elements during the base building construction, strict acoustic requirements within the open office work environment, the acquisition of the client by a parent company halfway through the Design Development Phase, and the overlay of the parent company’s design standards with the client’s orignal intent. 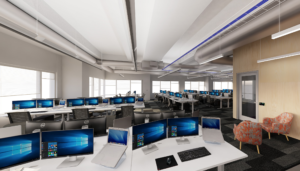 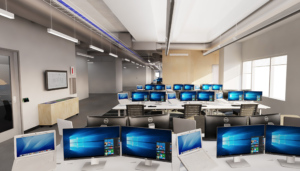 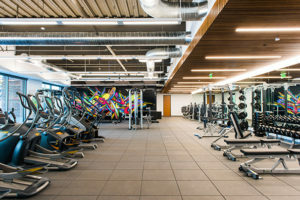 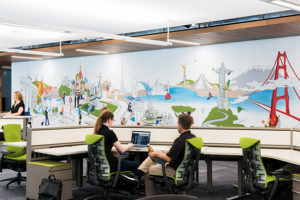 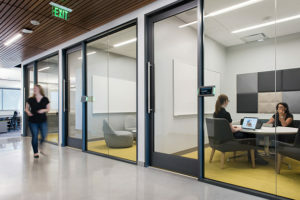 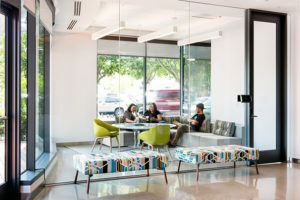 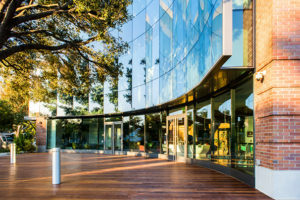 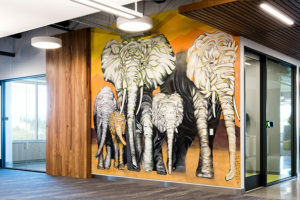 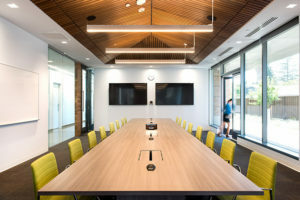 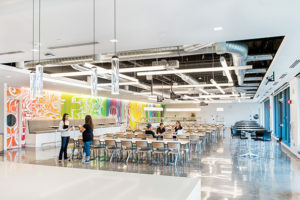 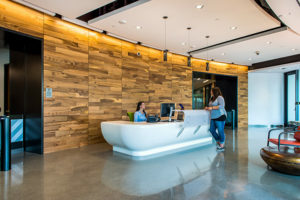 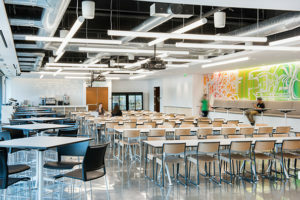 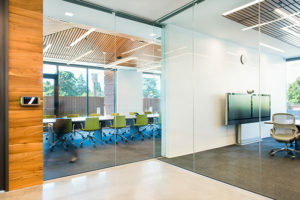 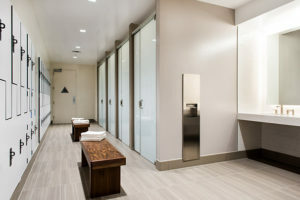 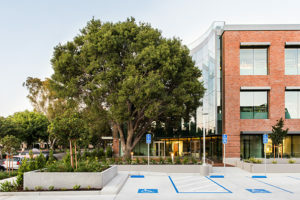 Part of the solution was to devise a program that establishes a modern work environment for 150 workstations per floor in addition to introducing new amenities for the staff, such as, a full scale gym, flexible all hands and cafe for 300 employees, high tech conferencing corridor, individual wellness rooms, custom garage, and rooftop patio. 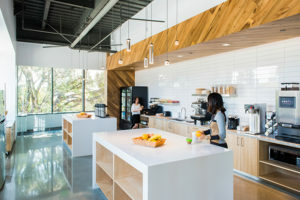 Finishes were selected both for the beauty and durability utilizing wood and color in a playful locations and orientations to distinguish each floor in a subtle manner. 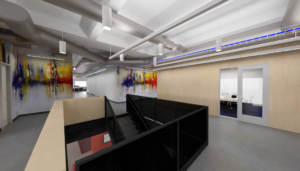 My role on the project varied depending on phase but included space plan layouts, schematic design sketches (front lobby and break room design), creating custom 3D models for furniture and millwork in Revit 2014, leading the construction documentation effort to submit for city and health department approval, coordinating design elements with structural and MEP engineers, weekly coordination meetings, OAC meetings, and the review of submittals and RFI’s with additional architectural sketches as needed. 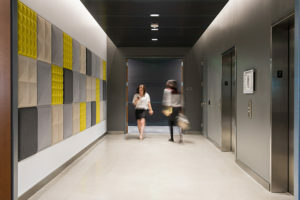 Truly a design for the memory books and one that I am proud to say that I helped create.